Recently I heard a story that I want to share with you. When the game of golf began the balls were smooth, not like the dimpled balls we associate with the game now. After awhile it was found that once the balls were hit so much that they became dented, the balls went farther. That is how the golf balls got their current design. This is the same with us. Life is not always going to be smooth. But when we use those dents for God, we can go far. perfect and complete, lacking nothing. Trials are hard. They can leave us dented and bruised. But using them for the glory of God brings Him honor. Jennifer, I love this story! I think I have stopped by before, but it is nice to meet you again. Love your blog design! Jamie, thanks so much for stopping by! You are so sweet! 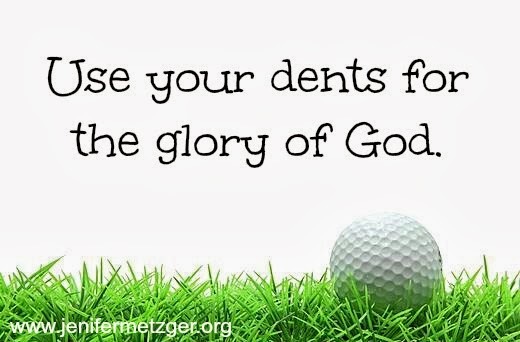 After spending a day on the golf course with my husband recently, I enjoyed learning this and love how you related this to using our dents for God's glory. Great post. 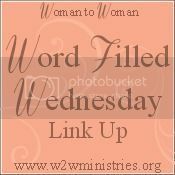 I'd love to have you join us for the Three Word Wednesday link up at my place. :) Blessings to you. Beth, thanks for stopping by! I will check out your link up. God bless. Oh I love this analogy of the golf ball. I've never heard it before, and it's so true!